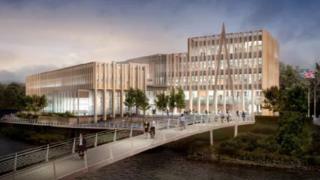 Council chiefs have approved plans for a new £50m headquarters in the centre of Durham. Durham County Council wants to leave its current home at Aykley Heads in favour of a development which will house 1,000 staff on a site currently occupied by a car park. The authority believes it will "reduce costs" and "boost the economy". Opponents fear it will increase traffic problems and could harm businesses in the area. The authority's planning committee voted 8-6 in favour of the plan which will see the new building replace The Sands car park, the Local Democracy Reporting Service said. The scheme would also see some workers based in Crook, Spennymoor and Seaham. Durham County Council's Aykley Heads site opened in 1963, although a 2015 council report concluded it was an "over-sized inefficient building". It is set to be redeveloped as a business park - previously described by the authority as a "once-in-a-lifetime opportunity" to create up to 6,000 jobs. Labour councillor John Clare, who represents Aycliffe North and Middridge, told the meeting: "If Durham County Council is to continue to deliver services which are up to the moment we have to get into a new building." Protesters last week gathered in Durham City with one market stall holder calling it "the most ridiculous idea ever".